Whether it's a birthday celebration,retirement party,corporate event,a themed evening such as a Burns Supper,or simply a group of whisky loving friends we will provide a bespoke service to suit your requirements. We will travel to any venue of your choice and supply everything you need to have a great time. Glasses,water jugs,whisky(of course),tasting notes etc. 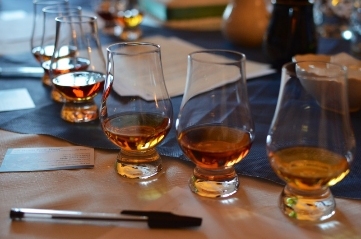 We'll give you and your guests a fun,informative whisky nosing and tasting. Tasting events will usually consist of between 3-5 specially selected whisky's and we will guide you through a tutored nosing & tasting in an entertaining and informative way with some interesting whisky facts and anecdotes included. Each event is structured to your requirements after discussions on which format will suit your needs & those of the actual venue being used. To compliment the whisky, should you wish to pair with food, we can offer your Whisky tasting with chocolate, or some delicious regional cheese's and traditional Scottish oatcakes. We will select everything to match. Something a bit more substantial perhaps? Then subject to the venue location & facilities we may be able to provide some buffet food to compliment the inspirational spirits. Prices can start from as little as £15pp for a 3 whisky tasting dependant on location & group size. Please contact us for an informal initial discussion on requirements and we will be happy to give an estimate of costs. To confirm a booking we will require a deposit of £50.00. Should the event be cancelled the deposit is fully refundable up to 7 days prior to the event. Please see the tab packages for more information on what we can offer.